What is Dynamic Types ? Dynamic types are new feature of C# 4.0, which can be defined easily by using the keyword dynamic. Dynamic types are not strongly typed i.e not bound with any specific data type, so they are different from implicit data type defined using var which can bind with any data type when we define. Like any other type Dynamic types also have base class System.Object. How Dynamic types works ? Let’s see the below example to understand dynamic types in more detail. 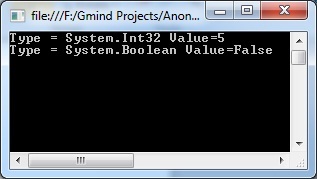 Change the value of the declared variable to boolean type and assign false to it, then print its type and value. When you compile the above code, the compiler will not give any error because the variable is of dynamic type. Since you can change it value at runtime to any other type, so, it is not strongly typed like other variable type of C#. Above example proves that the dynamic type variable gets evaluated at runtime not at compile time. There is no intelligence support for the dynamic types in Visual Studio which we find with other type, or, user defined types. As shown in above image you can see that the variable is dynamic type and its type gets resolved at runtime. Because Dynamic type values get resolved at runtime not at compile type you can attach any method with the variable as below. So beware with the name of the method we are calling upper case or lower case otherwise it throws exception at runtime. 2. Dynamic types are not able to use most of the methods of Linq API. 3. Linq queries cannot use Dynamic types to get data. Where dynamic variable are more usefull ? Dynamic types are more useful when we use Reflection i.e. late binding or COM component in application. Basically it minimizes the amount of code and also makes the code under stable. Here in this post I am just going to discuss how to use dynamic types when developing application using Refection. As you see Class has two methods (showMessage without parameter,showMessageWithDetails with parameter) which simply display message on console. I am going to call the method(s) of the Hello World class using reflection. Above method takes assembly as argument. Create object of the Hello World class and then call the showMessage method. By using dynamic types we can easily call the method and it’s also minimizing the amount of the code to be written. Now I am going to call showMessageWithDetails method of Hello World class, which is having set of parameter. To call method with the parameter we need to create array of the object which get passed to the method when we call the method. When calling with dynamic there is no need to create any extra array of object. Just have to pass parameter as we do in normal method call. Dynamic types are more help full we do late binding at runtime. It’s make code easy and understandable. I am generally just an observer when it comes to blogs, but this actually made me want to leave a comment. Wonderful work!